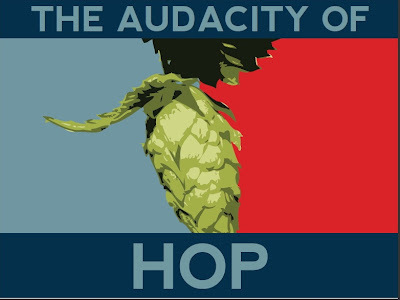 I hope that you are bringing an audacity of Hop for me. Please - tell me this is true. Well, I might, but here is the conundrum. There is one bottle of Sean's brew left in the refrigerator. However - for reasons known only to him - Sean designs these very cool labels but does not bother to actually put the label on the bottle. So we sampled several of his brews, and I don't know which of his brews lives inside this unlabeled bottle still in my possesion. The only clue - a purplish dot on the cap. Sean?